Once thought to be passive sentinels, microglia now seem to be crucial for pruning back neurons during development. A microglial cell (green) from the developing mouse brain is shown as a 3-D image and 3-D computer reconstruction. Synapses from neurons projecting from the eyes (red and blue) are engulfed and seen inside the microglial cell. 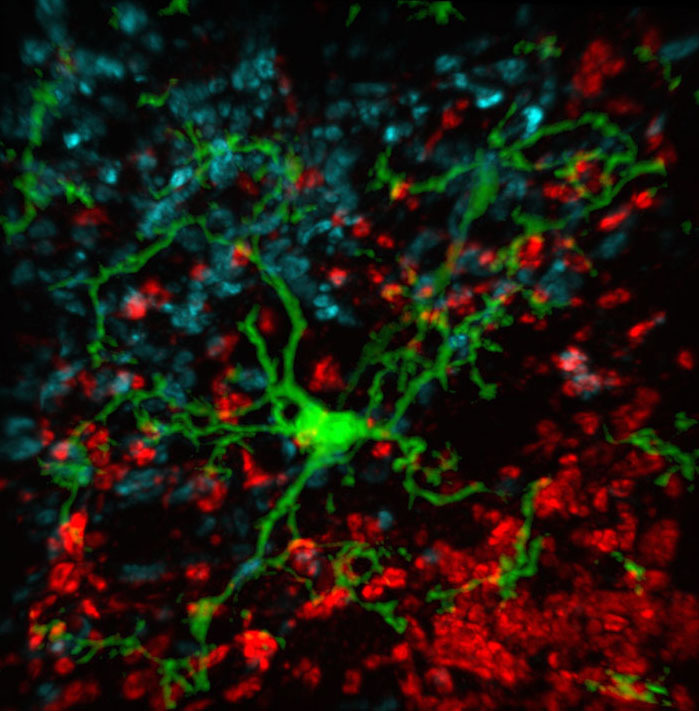 A team of scientists at Boston Children’s Hospital, supported by funding from the National Institutes of Health (NIH), uses images and movies such as this one to analyze cells in the developing brain. Read more about this research here. Movie from Schafer et al., Neuron, May 24, 2012., courtesy Dorothy Schafer, Ph.D. and Beth Stevens, Ph.D. at Boston Children’s Hospital. This research was supported by the National Institute of Neurological Disorders and Stroke (NINDS), the National Institute of Drug Abuse (NIDA), the Eunice Kennedy Shriver National Institute of Child Health and Human Development (NICHD) and the Smith Family Foundation. Microglia destroy and eat under-used synapses in healthy brains – understanding how and why could help tackle neurodegenerative diseases. Researchers show how immune cells in the brain target and remove unused connections, or synapses, between neurons during normal development. Immune cells known as microglia respond to neuronal activity to select synapses to prune, and eliminate synapses in the way that bacterial cells or other pathogenic debris are eliminated.